An oil company was having problems with the earth continuity of a low voltage feeder. 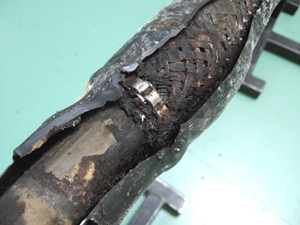 The problem was narrowed down to a heat shrinkable cable joint installed between 15-20 years previous and manufactured by a company no longer in business. On investigation it was obvious the material had not reacted well to the years of hydro carbon attack. The butyl mastic inner fill had turned to a sticky paste and the inner, connector insulation tubes, had also suffered. The cause of the earth continuity problem was due to poor connections onto the wire armours and subsequently, liquid rubber isolating the armours from the earth continuity lead. Even though the joint used was not designed to withstand these conditions, it had survived remarkably well, and only failed as a result of hydro carbons, entering the cable some distance away and travelling between the wire armours and inner sheath to the cable joint, and finally attacking the joint from within.